Insights from the development of a Liquefied Natural Gas Terminal in Ireland illustrate how energy provision is always embedded in wider networks, which connect geographies, finance, state and private interests. Opposition must not just focus on the point of extraction, but on the wider political and economic relationships that enable certain forms of energy to dominate. 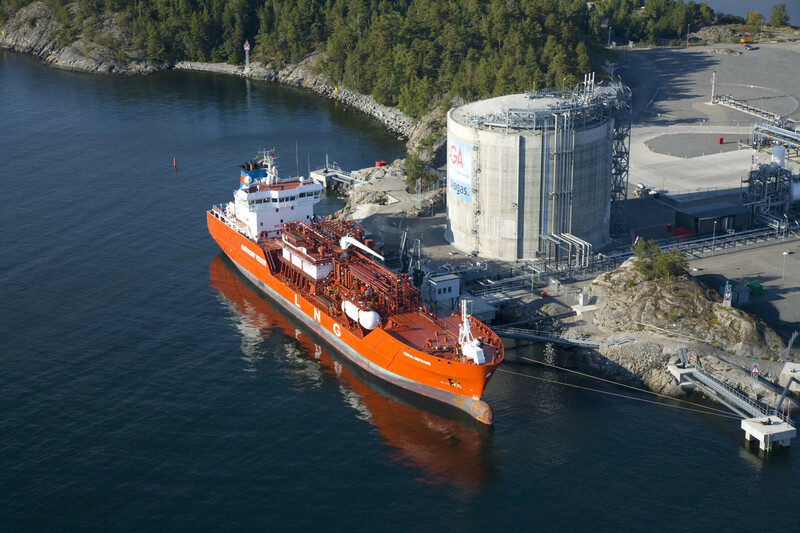 LNG terminal at Brunnsvik Holmen in Nynashamn (Sweden). The terminal, operational since March 2011, is the first of the Baltic Sea and has a storage capacity of 20 000 m3. Source: my news desk. This piece of research and analysis arose from an online course with the ‘Debt Observatory in Globalization’ (ODG) called ‘Energy for the EU: Challenging Cross Border Cooperation’. The short course covered the recent trend towards the financialization of energy infrastructure – i.e. the growing role of financial institutions (banks, investment funds) and global fossil fuel corporations in shaping the direction of our energy futures (not away from fossil fuels towards more democratically managed energy systems, but on the basis of short-term, high risk investments and profit-maximization). A key part of this module was to examine the new relationships emerging between financial institutions and investors, global corporations, and national and European governments, relationships, which are often opaque, highly technical, and thus removed from any meaningful public debate or democratic process. The combination of planning laws, financial instruments, large-scale engineering, and European environmental regulation, renders decision-making in these areas not just highly uneven but often times arbitrary, with private investors and commercial interests usually benefitting from this murkiness. Prior to taking the module, I had never heard of the Shannon Liquefied Natural Gas (LNG) Terminal. This is significant because this obscurity is part and parcel of the depoliticization of major energy projects. After a small amount of research, it became clear how this new development fits within a wider, European strategy for energy (gas) security, how this functions to channel (public) money from the European Investment Bank into a high-risk, private-public partnership, and how this is facilitated by the almost complete lack of public knowledge and debate about the consequences of such developments. But opposition does exist, and needs to continue through the building of more-than-local alliances. What is the Shannon LNG Terminal? The Shannon Liquefied Natural Gas (LNG) Terminal is the first LNG terminal to be developed in Ireland. Liquefied natural gas is natural gas, which has been turned into a liquid form for ease of transport – mainly for transport over sea. LNG Terminals are a vital point in this process as they receive natural gas in liquid form, turn it back into gas, and then introduce it to a gas pipe network. This has all became possible in Ireland with the building of a natural gas pipeline connecting the West of Ireland with the East of Ireland (and ultimately the UK) in 2002. The pipeline crosses the Shannon River 25 km from the site of the proposed terminal. Site location of the LNG Terminal at Kerry, South West Ireland. Source: Shannon LNG. The Shannon LNG Terminal was first proposed in 2006 by Shannon LNG Ltd., a company, which was originally owned by Hess LNG, a subsidiary of the US multinational Hess Corporation, one of the world’s leading fossil fuel companies. Hess was granted planning permission for the terminal in 2006 – the first project to be “fast tracked” under Ireland’s 2006 Strategic Infrastructure Act. The terminal was to be constructed on 281 acres of 600 acres of Shannon Development owned land in the South West of Ireland. Initially, the Shannon LNG Terminal was a private development backed by the local authorities and the national government keen to secure energy supplies (Ireland is dependent on the UK for natural gas) and to provide jobs in a relatively marginalized part of the country: Shannon LNG claimed it would create around 650 jobs in construction and about 100 full-time positions when operational. Unsurprisingly, politicians from across the political spectrum emphasized the need for jobs and attracting FDI, criticizing the ‘unnecessary’ bureaucratic hurdles (national and European planning and environmental law) that stood in the way of the ‘win-win’ development (Irish Examiner). Shannon LDG spent more than €67m trying to progress the project but never made it to the point of construction. This was due to an unintended consequence of the proposed new gas terminal: if the terminal came on line, gas prices would rise for Irish customers. This was because the terminal would render the interconnector gas pipeline with the UK redundant (a ‘stranded asset’). But the interconnector belongs to a state-owned utility and thus the costs of maintaining it would continue to be borne by Irish customers. For this reason, Ireland’s Energy regulator told Shannon LNG it would have to pay a €10m tariff per year towards the operation and maintenance of gas interconnectors with Britain – this led to legal wrangling and ultimately delays to the project (Irish Examiner). The “Kilcolgan Residents Association”, representing nearby residents of the proposed LNG terminal and people with close family and economic ties to the area, was set up in 2006 in response to the proposed development. The residents began to inform themselves about the development and concluded that the proposal was being led by a large, private company based on little more than the availability of land in the area and without the necessary strategic assessments (contrary to EU legislation). The “Kilcolgan Residents Association” submitted a recommendation calling for the rejection of the planning application by Shannon LNG on, among other things, safety, environmental, economic and residential amenity grounds. Shortly after this, the residents group expanded into ‘Safety Before LNG’, a campaign group representing people from both Kilcolgan and beyond, including networks of conservationists, environmentalists, and individual politicians. In early 2016, Hess sold its share of Shannon LNG at a time when it was experiencing sharp declines in revenue and share price due to the falling cost of oil (Irish Independent). A new owner has come forward but their identity is unknown and their plans for the long-delayed development are not yet clear. What is clear is that recent changes in Europe’s energy policy look set to resuscitate the stalled project. Map of main European gas pipelines. Source: BBC. 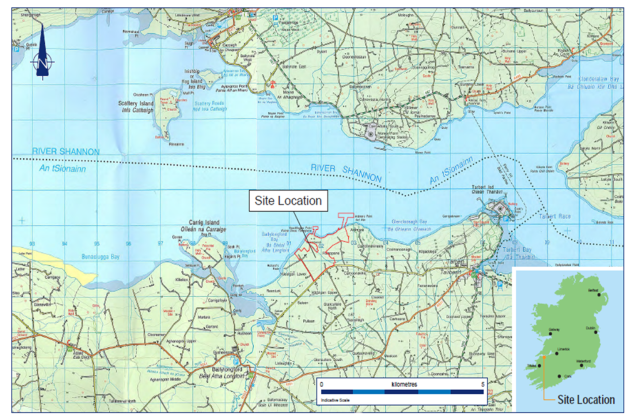 In late 2015, the proposed Shannon LNG terminal was included on the European Commission’s ‘Projects of Common Interest’ (PCI), following lobbying by Shannon LNG. This list of over 200 energy infrastructure projects around Europe identifies those developments considered to be of strategic interest for the EU in terms of increasing energy security. This is largely the result of continuing uncertainty surrounding gas supplies from Russia and the Ukraine. The Shannon LNG has now been identified as a strategic hub for Europe due to its location on the western Atlantic seaboard – receiving liquid natural gas from America, via container ship, processing it, and then distributing it across Ireland, the UK, and ultimately into Europe through a network of new and existing pipelines. Placing the Shannon LNG terminal in the context of the EU’s overall energy strategy now changes the entire character of the project (and the likelihood of it being completed) as the reasons for its development are no longer just about regional/national development, but European energy supply and security. Concretely, being placed on the list of PCI means that the Shannon LNG Terminal is now eligible for EU funds totaling €5.35bn and accelerated planning and permit granting. What is wrong with the Shannon LNG? What these developments illustrate is that projects like the Shannon LNG terminal do not just have implications for local residents and communities. European energy policy and financial institutions (the EIB) are re-shaping our collective energy futures and this convergence materializes in energy infrastructures like the Shannon LNG Terminal – which is what makes them so significant. Across Europe, other LNG terminals and vast networks of gas pipelines are being developed in similar fashion. It is important to pinpoint the longer term systemic problems they represent. First, investing in costly gas energy infrastructure effectively locks us in to the use of natural gas for the coming decades. Thus, besides the immediate, local environmental impacts and risks, the consequences in terms of the continuing extraction and burning of fossil fuels (natural gas) are much more extensive: as soon as gas infrastructures are build, they stimulate the continuous exploration and drilling of natural gas (both conventional and unconventional). A secondary consequence of this is that an energy system set up for gas will undermine the potential for clean energy investment and development (wind, tidal, biomass) which requires entirely different forms of infrastructure. Second, the financing of these infrastructure projects involves risky public-private partnerships in which most of the risk is carried by the European public. The financial difficulties of Hess and their decision to pull out of the project illustrates just how risky such projects are. It now looks likely that instead of allowing a private company to carry the burden of that risk, the EIB and Irish government is going to step in to carry that risk. The new owners of Shannon LNG will only be too happy to receive low-interest loans and direct investment from the EIB to develop a strategic gas terminal in Ireland. More than likely the company will be one of the big fossil fuel players keen to diversify into natural gas with the prices of coal and oil so low. And if the project proves a failure? The private company can walk away with minimal losses and the cost in financial, social and environmental terms is left to the public – whether in Kerry, Ireland or Europe more generally. Crucially, all of this is being worked out without very much public knowledge or scrutiny. In fact, the identification of the Shannon LNG Terminal as a ‘Project of Common Interest’ not only opens up flows of public money into the project but also enables the development to benefit from ‘fast-tracked’ planning and permits. Something as seemingly banal and ‘technical’ as a Liquefied Natural Gas Terminal can help us to trace the ways in which European energy policies and flows of finance capital are shaping our energy futures so dramatically – the seemingly ‘technical’ nature of the infrastructure is precisely what obscures the political, economic and energetic relationships that are emerging and congealing without us even knowing about them. So what can social movements do? Across Europe opposition groups like ‘Safety before LNG’ are emerging to block and oppose similar kinds of energy infrastructure projects. Many of these begin with local campaigns but are quickly able to draw on wider resources, tactics and experiences, which have been hard won from previous and ongoing struggles and movements. Ireland is a good example, where the long, drawn out struggle in Rossport, County Mayo, over the Shell gas refinery has not only raised awareness amongst activists and communities about infrastructure and energy, but also produced knowledge to be shared and developed – about the workings of environmental law, the tactics of fossil fuel companies, the response of the state, the value of direct action, organizing alliances, and so on. At the same time, the circulation of knowledge and struggles does not happen automatically. Making connections and alliances involves work and imagination. The aim is not just to increase numbers but to help campaigns escape their familiar identification as merely ‘environmental’ or ‘local’ – a strong tendency in the media, and one that is not always helped by campaigns that place an emphasis on technical disputes over environmental assessments or aesthetic concerns. Energy is always embedded in wider networks, which connect geographies, finance, state and private interests. Opposition must also operate on this basis: not just focusing on the point of extraction, but on the wider political and economic relationships that enable certain forms of energy to dominate. Efforts to resist the opening up of new fracking frontiers in Ireland, for example, can be seen as part of the same EU energy policy and financial opportunism that underlies gas supply infrastructures, such as the Shannon LNG Terminal. Similarly, those who campaign for clean energy (wind, biomass, tidal), including larger environmental NGOs who benefit from funding, need to recognize that investments in gas energy infrastructure directly undermine the possibility of these cleaner energy systems coming into being. If the Shannon LNG is built, sinking millions of EU public money into a future locked in to natural gas, the potential to foster alternative energy futures, which are not only environmentally sustainable but also democratically owned and managed, becomes instantly reduced. *Patrick Bresnihan is a Lecturer in the Geography Department Trinity College Dublin. His research interests include: the political ecology of vital infrastructures (particularly water and energy); neoliberalism and environmental governance; and the theory and politics of the commons. He is also part of the Provisional University, where a first version of this blog post appeared.